There's always a method to the madness. A couple days ago, I posted about having some cards in my Watch List for a long time. The reason I noticed that is because I went to that list to remove a card that I watched for more than three years. Another copy showed up on eBay and I was able to grab it for about half the price of the first copy. I was pretty excited about getting this card in. It is one that I've always wanted, and it may be a favorite in my collection. 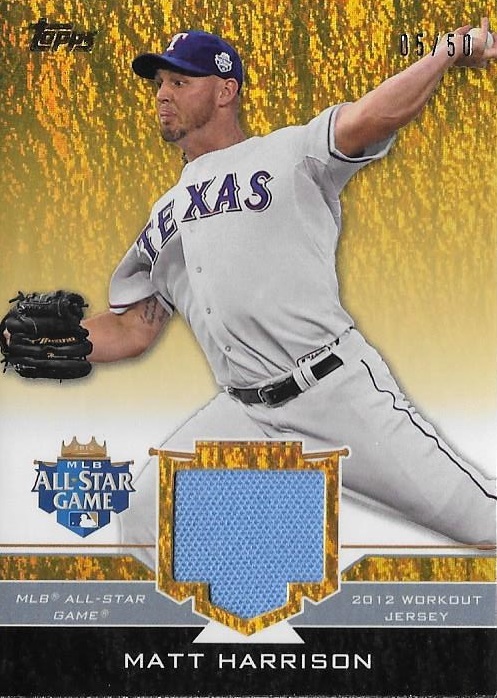 From 2012 Topps Update, this is the gold parallel of Matt Harrison's All-Star Stitches card. Yes, it's just a relic card, but it may be the most beautiful relic I've ever seen. The gold shimmer really makes the card stand out. Furthermore, it is representative of the only year Harrison made it to the All-Star Game. Even the back of the card is attractive. The framing and color scheme really work here. I'm a big fan, and I couldn't be more excited to have this card in my collection. I went back to look at the first copy a couple of days later and noticed that it was gone. That afternoon, I received a package from COMC. I was intrigued, as I haven't ordered anything from there in a while. I opened it up and found the copy of the card that I watched for more than three years (it was on eBay through the COMC auction service). A friend purchased it and sent it my way as a nod to my late grandmother, who passed away just over a year ago. She was the one that got me into collecting. I miss her very much. So, here's the story, in short: I watch a card for more than three years, then purchase a cheaper copy that appears. A couple days after receiving the card, I also receive the first copy as a gift. The world is a pretty incredible place. What is the longest you've watched a card before pulling the trigger? I've got a number of scans from other blasters that I had planned on blogging about, but the contents of a blaster I purchased yesterday forced it to the front of the queue. I had to make a quick run to Walmart for a couple things and decided to grab one of the available blasters of 2019 Panini Stars and Stripes. I'm a sucker for anything Team USA, so thee cards are right up my alley. Each blaster promises two autographed or memorabilia cards per box, on average. Let's take a look at what I pulled. 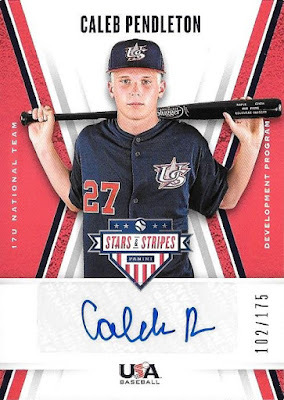 First was this Caleb Pendleton auto. 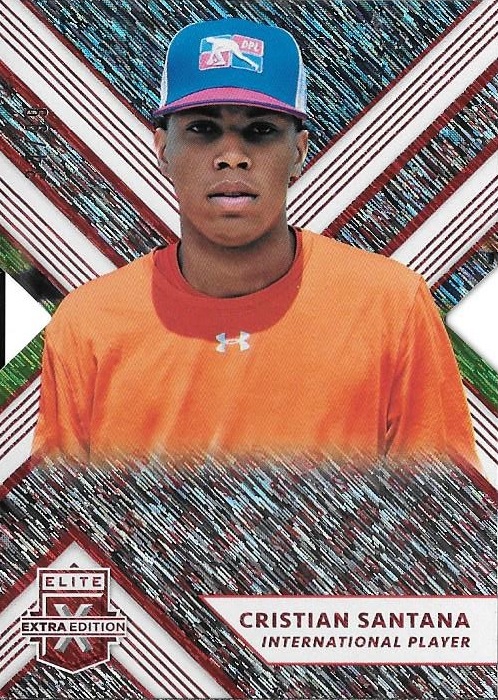 Pendleton is a member of the 17U National Team, a squad that works in the USA Baseball development program. Like Bowman, there may be a wait to find out if he makes it to the majors. This was the third hit of my box, a Hunter Haas relic auto. The wait for Haas will be even longer, as he is a member of the 16U team. 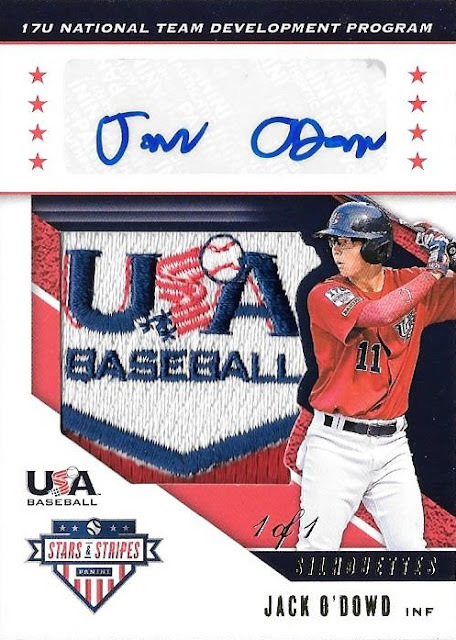 This is a 1-of-1 Jack O'Dowd USA Baseball patch autograph! How awesome is that?! Again, this guy may take a while to determine if he ever makes it to MLB, but it's a beautiful card nonethelless. 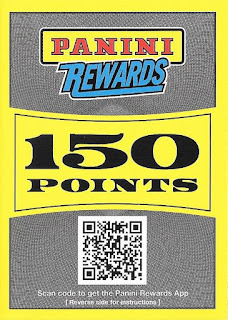 What's the best card you'v pulled from a blaster (of any product!)? Yesterday, I was going through my regular eBay check. 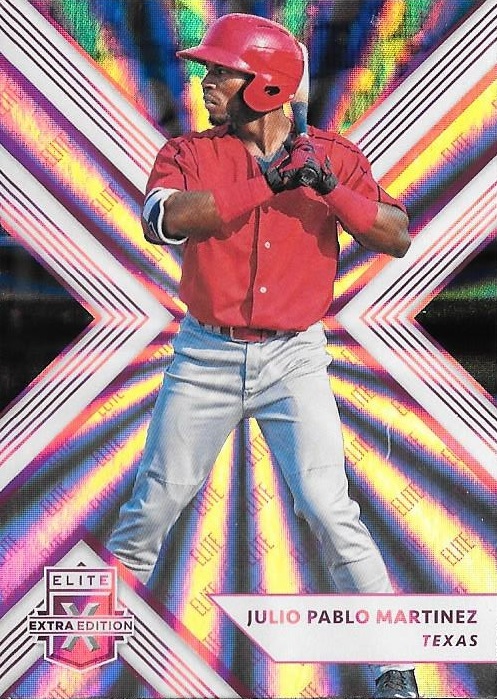 I have a handful of saved searches that I look at a couple times a day to see new postings of cards I want. I had an itch to buy something, but none of the new listings jumped out at me. So I flipped over to my Watch Items folder. As I scanned through it, I realized that a couple cards had been in that folder for a while. A while as in years. These cards, for whatever reason, have never sold and are continuously re-listed. Let's take a look at a couple. First up is a rookie variation of Yu Darvish from 2012 Topps. I know Cubs fans probably hate him, and a lot of Rangers fans were disappointed by him, but I'm still a Darvish fan. 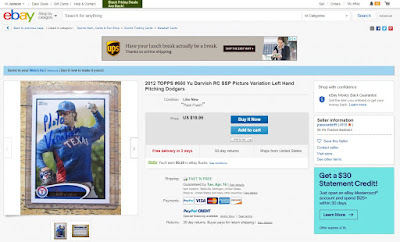 This card features Darvish throwing left-handed - something he's good at. Reports are that he can throw in the low- to mid-80's with his left hand. I've always thought this was a cool shot. I saved this listing when I first saw it at least three years ago. I'm on a budget, and rarely do I go out of that budget to get a card. I have waited for the price to come down, but it hasn't. A cursory search for the card on eBay now shows the cheapest listing at $12 or best offer, with $4 shipping. Maybe I'll swap out listings. The next long-tenured card in my Watch List is this dual auto featuring Eric Campbell and my primary PC guy, Matt Harrison. Unlike the Darvish, the reason for not buying this card isn't money. while I think the price could be cheaper, I do think that the asking price here is fair. I just don't like this card. I think it might be one of the ugliest cards I've ever seen. So, since I know that I need this card for the collection, I drag my feet when it comes down to buying it. Lastly, the longest-watched item in my list. 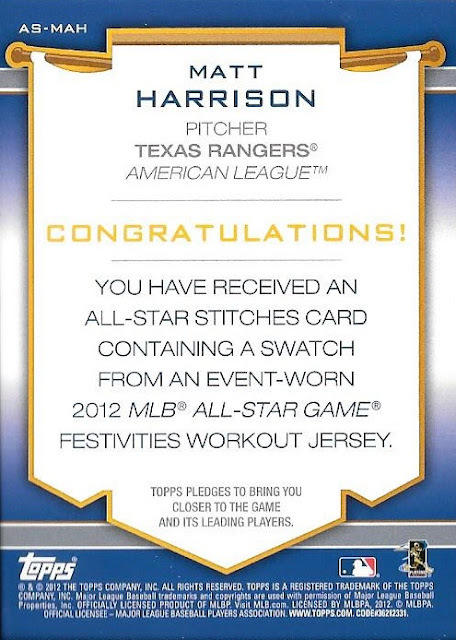 This hails from 2013 Triple Threads, featuring three nice patches from Harrison's All Star uniform. Unlike the last card, I think this card is a beaut! Like the Darvish, my problem here is cost. 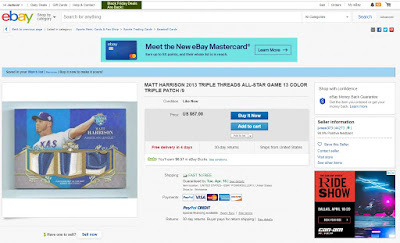 This card has been listed for $57 and has been for almost five years. I've tried emailing the seller to see if we could work out a deal for it, but I never hear anything back. So, the card will sit in my Watch List until it does get cheaper or I find another copy for less. This leads me to what I believe is an interesting Blog Bat Around question: Which card(s) have been your Watch List the longest and why have they been there so long? Back in January, one of the cardboard blogosphere's most beloved bloggers Wes (a.k.a. JBF) of Area 40 decided to hang 'em up. He decided to do so in grand fashion, collected what seemed to be a ton of unopened boxes and packs. And then - because he is the nicest guy on the Internet - he decided to give those cards away as a final farewell. I was fortunate enough to have the Texas Rangers in the break. They netted me a number of awesome cards, the ones I like the most I will share with you here. 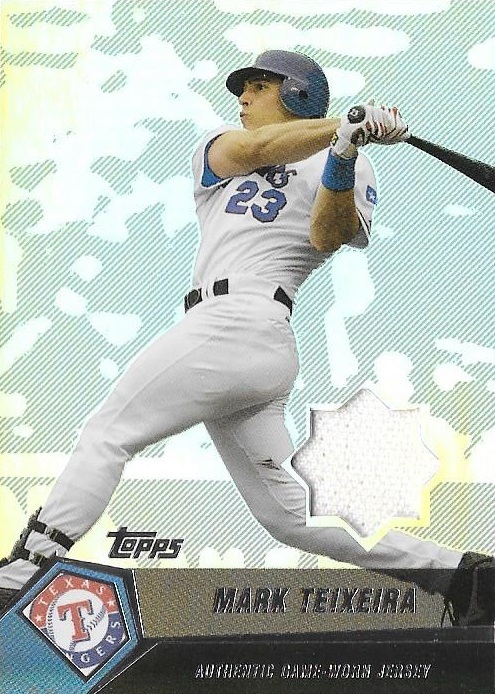 A 2004 Topps Clubhouse Collection relic of perhaps the greatest Ranger, Mark Teixeira. First, I like the card. It turns out that these were packed out in different tiers, meaning that some were harder to snag than others. Go figure. 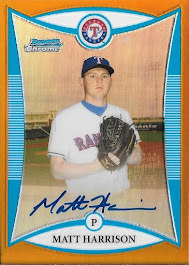 Second, I call Tex the greatest Ranger because his trade netted the Rangers Elvis Andrus (who is still our starting shortstop - check out his walkup music from yesterday's opening day), Neftali Feliz (the 2010 AL Rookie of the Year), and still one of my favorite players and main PC, Matt Harrison. Jarrod Saltalamacchia and Beau Jones were also included in the trade, but they had much less of an impact than the previous three. Hank Blalock also had a card in the 2004 Topps Clubhouse Collection set. 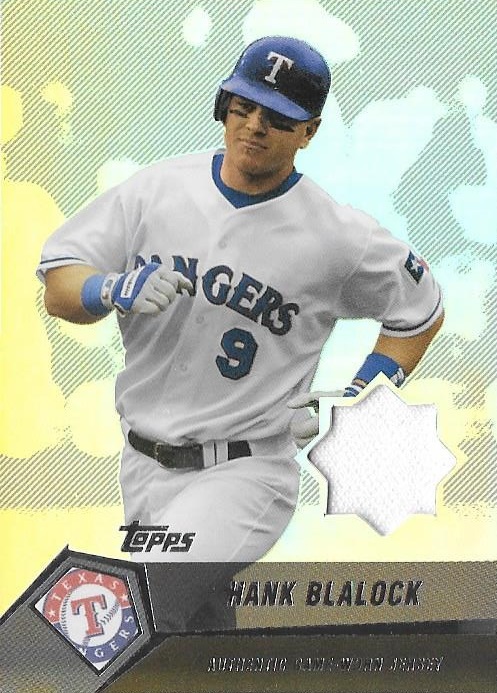 I always liked Blalock...I was certain he would have a much more significant career than he did. I received another card for this set featuring Chan Ho Park, but I didn't scan it. This hails from the 2015 Topps Strata set, the first year of the line if I remember correctly. I always thought it was cool that Topps included the MLB certification sticker so you could look up the event. Wes, I never traded with you prior to this, but I can say that I was a regular reader. Your trade wars with Bob Walk the Plank were epic. I always looked forward to seeing what you were going to fire off next. There are seemingly few good people in the Internet, but you are truly one of them. Godspeed on whatever you choose to do next. Thank you. 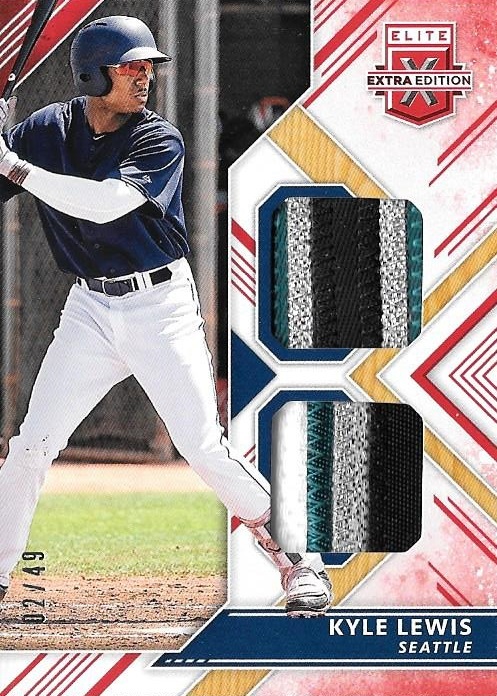 In my last post, I mentioned that I would be giving away a pretty sweet Kyle Lewis dual patch relic along with 150 Panini Points. I meant to do the drawing Friday, but I was "lucky" enough to come down with a virus and spent Friday, along with the weekend, recuperating. I finally felt well enough to jump online and put together a post recognizing the winner tonight. We had three entrants, so I randomized the list three times. Ketchupman36 a.k.a. The Cardboard Flame! I'll reach out to you and get the cards in the mail! During the course of the past couple years, I've been setting aside any Corey Seager cardboard I pull. I carefully sleeve each one and then place them in a top loader. After a small stack builds, I send them off to Greg of Plaschke, They Sweater is Argyle. A massive patch auto ( and on-card, at that) featuring former Rangers first-round pick, Luis Ortiz Jr. from 2014 Leaf Trinity. This card is an absolute beauty. I was sad to see Ortiz traded. He was part of the group of prospects sent to the Brewers to acquire Jonathan Lucroy. I was certain he would be a solid number-three starter for us. Instead, he made his major league debut with the Orioles last season. He was rouged up pretty badly in that start and accompanying appearance. However, I owe a long-overdue "Thank You" to Greg for sending this my way. You always go above and beyond to send me some incredible cardboard. I am very grateful to consider you a friend, good sir! Back in December, my scanner went bonkers. At least, I thought it did. Last week, I was working on my dissertation when my laptop started going crazy. It turns out that my laptop was the problem, as it was creating issues by misreading external hardware code...or something like that. The repair guy tried telling me, but I openly admit I don't speak tech. What I do know is that I had to get a new laptop. Late last week, I did just that. I hooked the laptop up to the scanner and everything seems to work! I scanned in some cards and then opened Blogger...and realized it has been more than two months since I last posted. Wow. Granted, I was having issues scanning, but if I'm being honest with myself and you, I must admit that I didn't have the motivation to blog, anyway. Last year was a tough one for me. I won't re-hash everything that made it that way, but I am glad it is over. One of my personal goals for 2019 is to work harder on being more optimistic and to not let minor setbacks turn into major roadblocks for me. Part of being more optimistic and happy means spending more time doing the things I enjoy. So, today I write. The fourth blaster of my Blaster Madness series features two blasters of 2019 Panini Elite Edition. 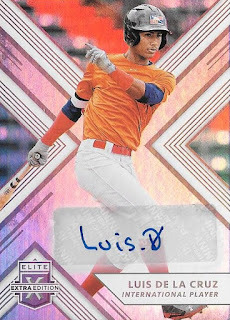 This is the first Panini baseball product of the year (I believe) and features many of last year's drafted players, most of the various USA National Team players, and many unsigned foreign (specifically Latin American) players. Each box contains five tota cards, two of which, on average, are hits (autographed, memorabilia, or autographed memorabilia cards). I snagged two looking for a specific player, but more on that later. For now, let's see how I fared. Each box also contains one exclusive pink parallel. 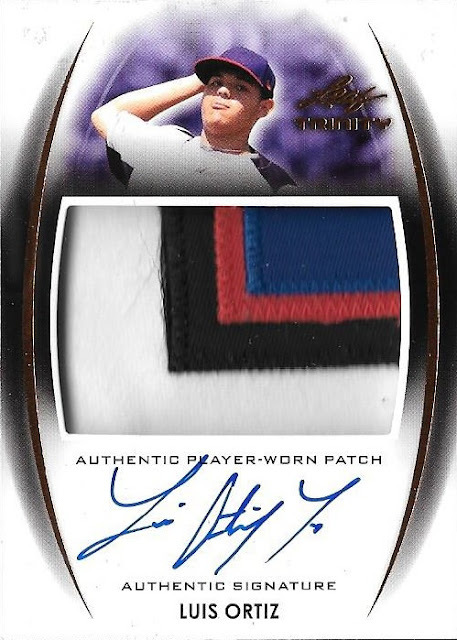 One of my pink parallels was of Rangers' prospect Juan Pablo Martinez. 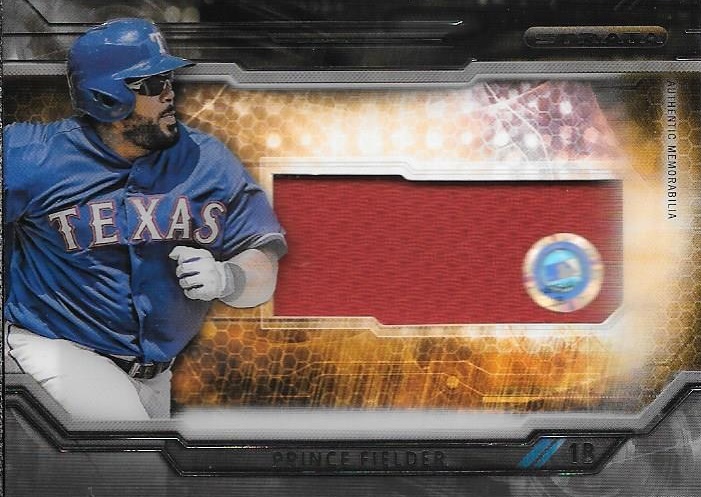 Sadly, this was my only Rangers card. 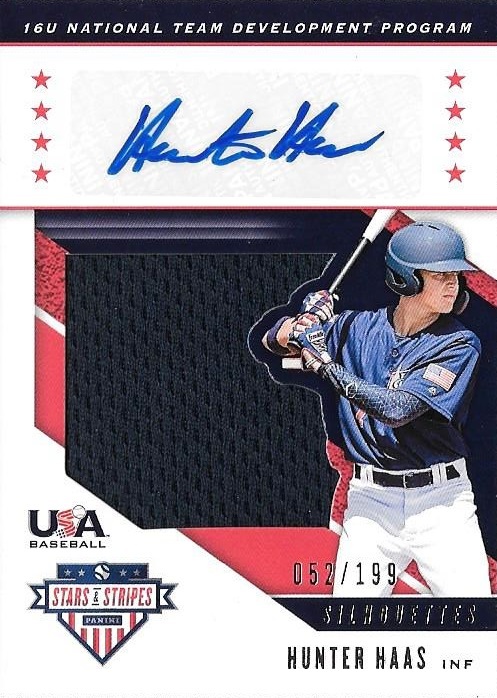 Martinez was signed early in 2018 - with money the Rangers tried to give to Shohei Otani before he signed with the Los Angeles Devils - and was MLB.com's second-ranked international prospect going into the 2018 season. He split the 2018 season between the Rangers' Dominican Summer League team and the Spokane Indians. This is the only numbered parallel in either of my boxes, and it happens to be the die-cut version numbered to 99. 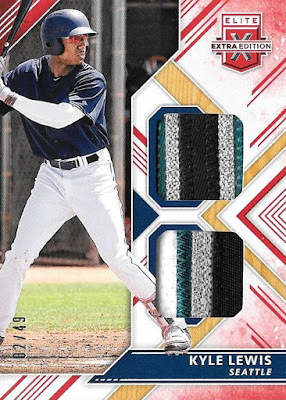 Appearing on the card is Cristian Santana, international free agent, not to be confused with the man of the same name in the Dodgers organization. I couldn't find much info on this Santana. 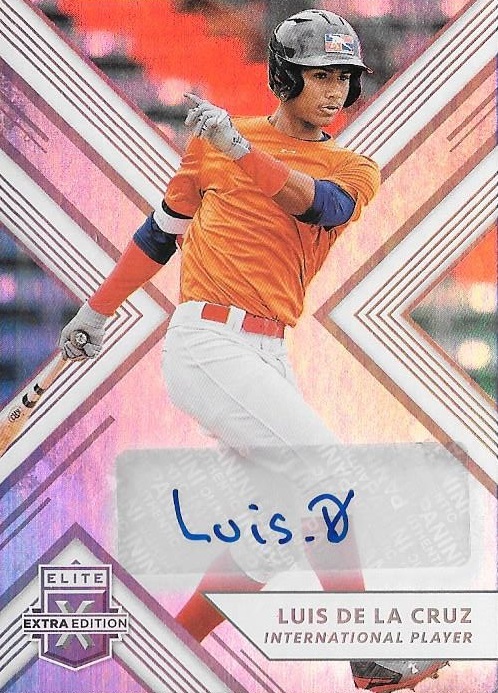 The only autograph appearing in either blaster is of another international free agent, Luis de la Cruz. It's autographed and it's legible, so it is automatically better than 95% of current autos, though it still isn't impressive. Again, I couldn't find much info on this player. My first relic appears as a quad relic of Shane Baz. 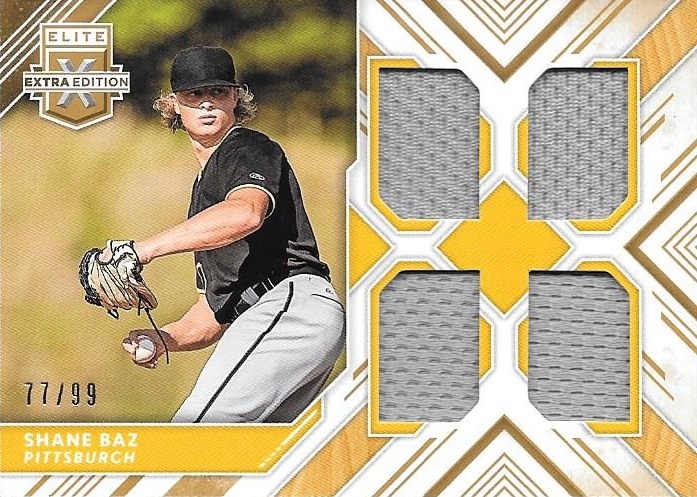 Baz was a first round pick of the Pittsburgh Pirates in 2017, going 12th overall. He was traded to Tampa Bay last year as a PTBNL in the trade that sent Chris Archer to the Steel City. The second relic I found featured two swatches from Kyle Lewis. Lewis was the 11th overall selection in the 2016 draft, going to the Mariners. Can we talk about these swatches though? How often do you see a card numbered to 49 have such amazing swatches? Beautiful! So there it is! I've decided that I am going to give away the points AND the Lewis relic. 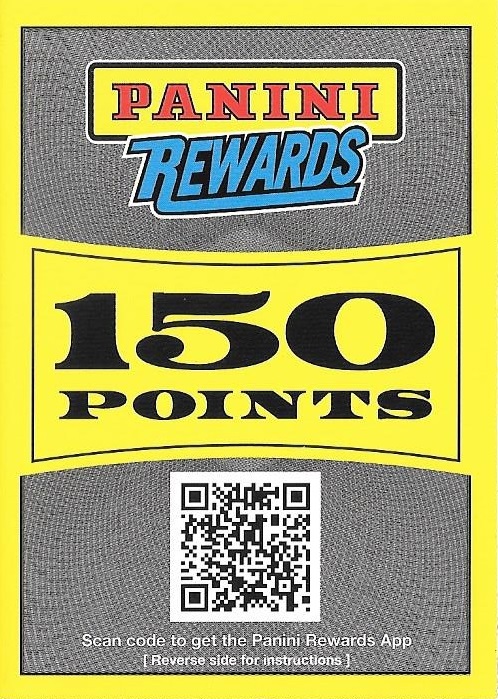 All you need to do is post about your favorite memorabilia card in your collection and then post a link in the comments below. I'll create a recap of the posts and then select a random winner from the comments! Don't have a blog? No problem! 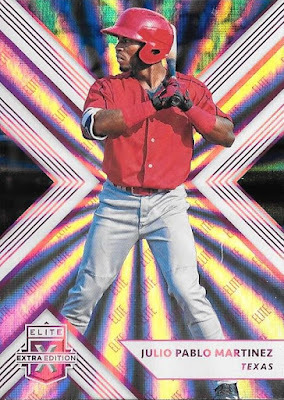 Tweet about your favorite memorabilia card and post a link to the tweet in the comments! The contest runs until February 22 at Noon central time. Ready, set, go! 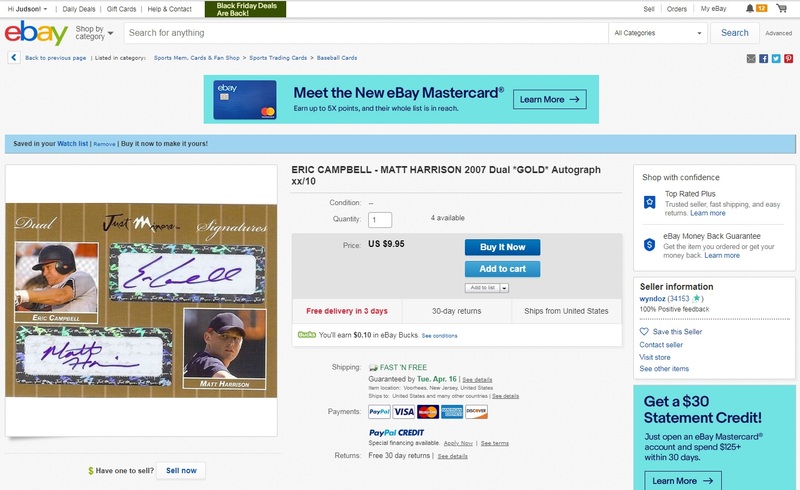 An adult who still clings to his childhood hobby of collecting baseball cards, autographs and memorabilia. Copyright 2013 by Judson Meeks. Picture Window theme. Powered by Blogger.